Fieldwork in the New Jersey Pine Barrens by BBG staff has led to the discovery of a previously unknown insect species, dubbed the Whitcomb leafhopper (Flexamia whitcombi). “A lot of people assume there are no new species to discover, or that any unknown ones are deep in undeveloped rainforest, but even here in North America, in the U.S.'s most densely populated state, look what can be found,” says Uli Lorimer, curator of BBG’s Native Flora Garden, who collaborated with the researcher who made the discovery. Dr. Andrew Hicks, an entomologist from the University of Colorado who is an expert in the genus Flexamia, was researching potential habitats where unknown species might be found when he came upon one of Lorimer’s photos of a rare pine barrens grass called Torrey's muhly (Muhlenbergia torreyana) on Flickr. Lorimer has been doing fieldwork for nearly a decade in the New Jersey Pine Barrens, along with Dr. Gerry Moore, a botanist with the USDA and BBG’s former director of Science, and he frequently posts photos of his work on Flickr. Leafhoppers of this genus tend to feed exclusively on a single species of Muhlenbergia, and Hicks thought that if he looked in the right habitat for the grass, he just might find a previously undiscovered leafhopper. The three then visited several sites in the region, where Hicks used a special canvas net to sweep the grass for leafhopper specimens. When he returned to the lab and studied his finds, he made his discovery. Torrey’s muhly is fairly abundant within well-preserved tracts of pine barrens habitat in New Jersey, but it is state-listed as threatened because such tracts have declined over the years due to development. They continue to be threatened by climate change. “The fact that a new species was found in the pine barrens is just one more piece of evidence of how important it is to study and protect sensitive habitats like these. There is still so much to uncover and so much to be learned about relationships between species,” says Lorimer. Wow! As you commented, scientific discoveries are still to be made. Suggestion: Publish this article somewhere teachers—at any level—can see it. 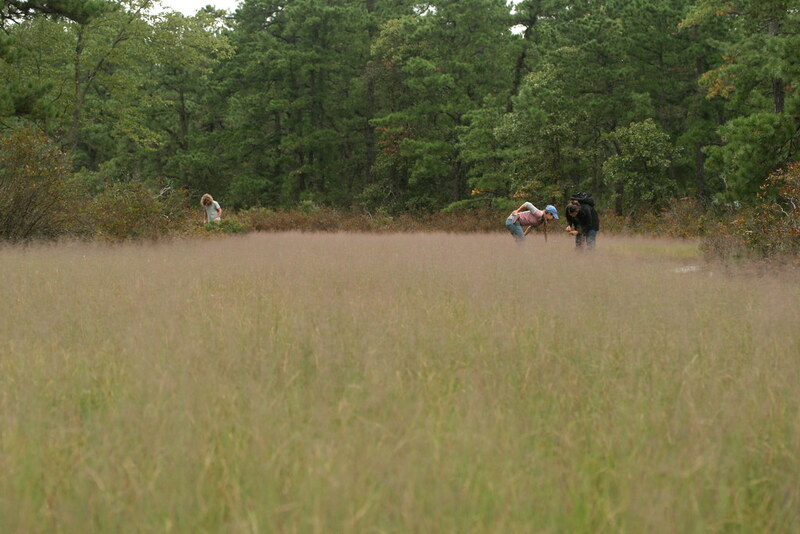 BBG staff and colleagues from Wave Hill and the High Line do fieldwork in the New Jersey Pine Barrens. Here they are studying a colony of Muhlenbergia torreyana. Photo by Uli Lorimer.